I love those moments in the kitchen when you throw some ingredients together and magic happens! This is one such dish. One night, four or five years ago, I went to the fridge after work, trying to figure out what to make for dinner. There wasn't a lot to choose from. I had kielbasa, green peppers, onion, and garlic. So I went to my pantry and there was a can of diced tomatoes that I had accidently purchased the week before, and a half of a box of pasta. I decided to go for it and what was birthed from this experiment, is probably one of my favorite dishes to date! It's so simple, yet is full of flavor. I know you are going to love it! want to do it get your pot of water on to boil. the only time you will have to actually season your pasta. take that time to do all of your prep work. Chop your vegetables, slice the kielbasa, open your tomatoes, pre-measure any ingredients. This will make cooking much simpler and faster! over medium-high heat, and allow to get hot. Once hot, add the olive oil to the skillet. Now place the kielbasa in a single layer across the pan. Remove from the skillet and set to the side. By this time your water will be at a nice rolling boil. Add the pasta and cook according to the directions on the box. Here it said 12 minutes to al dente. Now to your hot skillet, add your onions. the heat to kind of reignite it's flavor! Now you will add the tomatoes juice and all. This is the secret ingredient. that has you saying "What is that?" Have I mentioned I am getting hungry? Now it is time to add your salt and pepper. Remember add a little at a time and taste. Now you can return the kielbasa to the skillet. Let the sauce simmer while you wait for the pasta to finish cooking. Once the pasta is finished cooking, drain off the water, and add to the skillet. Toss everything together and there you have it! and quick enough to make for a weeknight meal! I know your family will love it and I would LOVE to see your pictures on my Facebook page www.facebook.com/thekitchenwife! Put on a pot of water to boil for the pasta. Be sure to add salt to the water. Prep all of your vegetables, slice kielbasa, open cans, pre-measure ingredients. When skillet is hot, add oil. 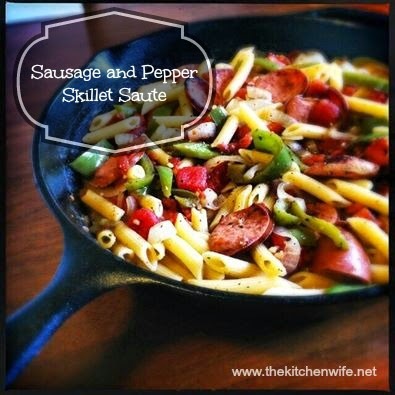 Place the kielbasa slices in a single layer in the skillet. Let brown and then turn each slice over. Allow other side to brown, and then remove from skillet and set to the side. By this time your water should be boiling. Add the pasta. To the hot skillet, add the onions. Allow them to just start browning. Add the green peppers and garlic. Stir together and let simmer while pasta finishes cooking. Just before pasta is ready, taste for salt and pepper. Add any seasoning the dish may need. When Pasta is ready, drain water, and add to the skillet.